Its name sounds awesome, like something out of Game of Thrones. 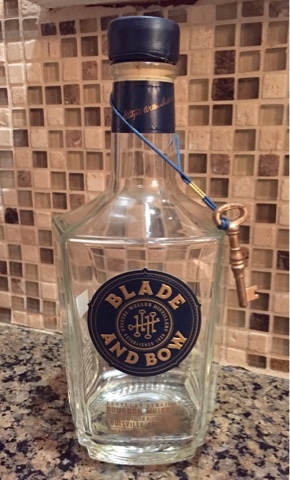 It's got a cool-shaped bottle, and it comes with a key around the neck. And it's because of these things that to this point I've refrained from buying a bottle of Diageo's Blade and Bow Bourbon. It was almost a matter of principle, that I didn't want to pay more for marketing gimmicks and fancy packaging only to drink an inferior product. But, here I am writing about it, so obviously my curiosity got the best of me, despite my principles, fickle as they are. The aroma was your standard vanilla and caramel, with a little bit of almond in the mix. Nothing overwhelming or particularly unique, and the flavor followed suit. My first impressions were that it's somewhat watery in texture, and not very strong (it clocks in at 91 proof). Though the traditional bourbons flavors come through, it does have a mild bite to it at the end. It reminded me somewhat of Jim Beam White Label in that it's fairly one-dimensional. After having it open a bit, it gained a little bit of complexity. The wheat in the mashbill began to come through, providing a mild, earthy undertone to the vanilla and caramel flavors. The finish disappointed, though. None of the flavor remained, perhaps due to the watery texture. It also sweetened up a bit after being open for a week or so. Perhaps this was due to the wheat, but in any event, I found it much more enjoyable than when I first poured a glass. It became more caramel forward, as well as a mild note of cloves. It also took on a slight pear flavor to boost the sweetness. Although the finish changed a bit, I wasn't certain if it was for the better or the worse, as a distinct flavor of orange peel lingered. Ultimately, my concerns over the use of gimmicky packaging to make up for inferior booze were founded. This bourbon really came across as only a small step above your standard, every day, grocery store bourbons. But at least I have a really cool key . . .